Do you always seem to have leftover rice on hand? If you've got some leftover rice that you'd rather not go to waste, here are some easy ways to turn your plain steamed leftover white or brown rice into a fabulous new meal or side dish! Most of these ideas for using up leftover rice would also be great for using up leftover quinoa, too. Read on for some uses for what to do with your leftover rice. Season your plain leftover white rice or brown and use it to make vegetarian stuffed tomatoes for a main dish or healthy side. 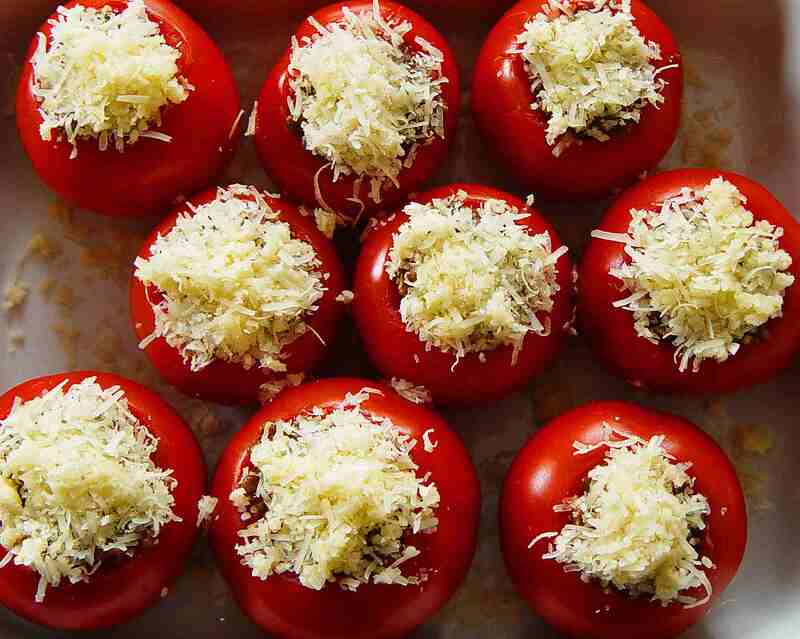 Slice off the tops of your tomatoes, fill with a seasoned rice mixture, drizzle with olive oil and bake. It's that easy! Your leftover rice can also be used for making stuffed bell peppers instead of stuffed tomatoes. Toss some garlic, onions, soy sauce and sesame oil in your frying pan, add your leftover rice and whatever veggies you have on hand, and voila - you have a new meal: vegetable fried rice! For variation, try adding pineapples, cashews, scrambled eggs (or tofu to keep it vegan) and different sauces and spices. If you've got lots of leftover rice, one great way to completely transform it is with this vegetarian lentil loaf recipe - it calls for two full cups of leftover rice. Never tried a vegetarian loaf before? No need to worry, since you really can't go wrong, and this recipe has over a dozen positive reviews. Sure, a vegetarian lentil loaf isn't exactly the same as meatloaf, but you may find that you actually like it much better. Heat up a can of beans, add some hot sauce and your leftover rice, and you've got yourself a quick bean and rice burrito! Add in whatever burrito toppings you happen to have on hand, such as salsa, sour cream, guacamole, or maybe even some leftover cooked veggies. Use your leftover rice to make ​rice soup! Pop open a canned soup and heat it over the stove, stirring in your leftover rice and some extra spices for a quick home-cooked meal suitable for the whole family. You can use your leftover rice to make a gluten-free bottom "crust" for a breakfast quiche as with the wild rice quiche recipe below, or, you can just toss the leftover rice in with the eggs and other ingredients before baking. Use about one cup of pre-cooked rice in your quiche. Rice pudding is a great way to use up lots of leftover rice all at once, and everyone loves rice pudding, kids, and adults! You can add some cinnamon and nutmeg, or some raisins and dried fruit for a breakfast rice pudding. If you've got just a bit of leftover rice on hand, try making dolmas - Middle Eastern stuffed grape leaves! Combine your pre-cooked rice with some fresh parsley or other herbs, and boil in some water with lemon juice and olive oil. For extra tangy dolmas, drizzle them with a bit of fresh lemon juice, just before serving.